Here’s an attractive idea: An 18-megapixel camera from Canon with interchangeable lenses, with a body that still fits into a jacket pocket. Add its reasonable $339 price point into the mix, and the Canon EOS M becomes a very interesting option for anyone looking for great image quality and manual control on a budget. The EOS M is in an interesting position: It’s not a new camera, but doesn’t have a replacement out just yet. It was first available in November 2012 for $800 (with a 22mm kit lens), and in late 2013, Canon announced the EOS M2 that replaced it. However, you won’t find the M2 anywhere in the States: in fact, Canon has no plans to sell it in North America. So it is technically not the latest mirrorless camera from Canon, which only serves to make it more attractive for some. After all, the best time to get a great gadget is often when it isn’t the newest kid on the block: That’s when prices drop, and you get the same great quality for a far lower price than before. To understand the Canon EOS M in context, we have to compare it to other mirrorless cameras of similar vintage. These aren’t the latest and the greatest currently on offer: For example, we’ll be looking at Sony’s NEX-5R, even though the NEX-5T is already available. The reason for this is simple: Price range. The EOS M can be had for around $340, and all three competitors we’ll be looking at here can be had for less than $400 (with one retailing for less than $300). Sony Alpha NEX-5R: Retailing for $396, the 5R features Sony’s Bionz processor coupled with a 16-megapixel CMOS sensor (compared to the EOS M’s 18 megapixel one). In terms of trim, it comes with a metal top and front plate, but the body itself is made of polycarbonate. It also has 25 focus points, compared to the EOS M’s 31 points. One big plus it has over the EOS M is with the display: Its 3-inch screen can tilt, unlike the EOS M’s fixed display. Samsung NX2000: Samsung isn’t known primarily for its cameras, but they merit attention – especially given the NX2000’s attractive $320 price point. With a 20-megapixel sensor, it offers a slightly larger resolution over the EOS-M. The sensor is also a tad larger: 23.5 x 15.78mm, versus the EOS M’s 22.3 x 14.9 mm. Of course, when getting a Samsung mirrorless, one key consideration is the lens mount: Samsung’s NX system is not very well established for now. That said, if you want to use Canon’s huge array of lenses with the EOS M, you will have to fork over for a dedicated adapter. Nikon 1 S1: The cheapest of all three competitors comes from Canon’s fiercest rival. The Nikon 1 S1 can be found for $259 (though there is already a Nikon 1 S2 for $447). It has a relatively small 1″ 10-megapixel sensor — much smaller than the EOS M’s, both in physical dimensions and megapixel count. Its display (a key component for a mirrorless camera) is half the resolution, too, at 460,000 pixels vs. the EOS M’s 1,040,000. It’s also not a touchscreen (unlike the other two competitors). On the plus side, its continuous shooting mode blazes along at 15 fps, more than 3 times faster than the EOS M which can only shoot at 4fps in continuous mode. In almost all other respects, it is a lesser camera. The Canon EOS M is a Canon. An obvious point, maybe — but the most important thing to understand about this $339 camera. It means you can get a $134 adapter that works with Canon’s fearsomely massive line of EF and EFS lenses. It also means the control scheme is familiar if you’ve ever used a Canon before – something we’ll cover in detail later on. In terms of raw specs, let’s first go over what the EOS M doesn’t have: No built-in flash (though my unit came with a flash that plugs into the camera’s hotshoe); no viewfinder (EVF); no Wi-Fi, and no built-in GPS either. It’s not waterproof, and is unable to brew even a mediocre cup of coffee. So what do you get? An 18-megapixel sensor that yields 5184×3456 pixel images. A Digic 5 image processor; ISO that spans the range from 100 to 25600 (boosted). RAW image support. 31 autofocus points. A custom lens mount, EF-M, that doesn’t have many lenses yet. A decent LCD that’s flush with the body and doesn’t articulate. These are the raw specs — and they do very little to convey what the EOS M is like to use. Holding the camera, the numbers and acronyms fade from view. The EOS M comes in black, white, silver, or red. Our own model is red, obviously. The body itself measures just 32mm thick (1.3″), or slightly less than two modern smartphones stacked together. While not made of metal, the camera feels satisfyingly solid and dense in the hand. Coming from a dSLR, its compact dimensions can feel disorienting at first: Gone is the comfy molded grip, to be replaced by an almost symbolic rubber strip. Yes, you could use it to hold the camera, but not very securely. In use, I found I wanted to hold the camera mainly by the 18-55mm lens, using the rubber grip just for added support. You won’t find many physical buttons and knobs on the EOS M. Up top, you’ll find a simple dial for toggling between auto mode, manual mode, and video mode. To its left is the small on/off button, followed by the hot shoe (there is no built-in flash), and finally two stereo microphones. On the front of the camera, the only button you’ll find is the lens release. The EOS M also features a mic jack, as well as a hot shoe for attaching the included Speedlite 90EX flash. All other controls are laid out on the back of the camera. You get Menu, Play, and Info buttons which surround a central dial. Coming from a Canon dSLR, this layout feels familiar but lacking — the most notable omission is the jog dial that the EOS dSLRs use to control anything from exposure compensation to aperture. In the EOS M, that’s what the touch screen is for. The EOS M’s 3″ touchscreen is high-resolution, bright, and responsive. It is also flush with the camera’s body, and doesn’t swivel or articulate — yet another drawback compared to, say, the T3i. In the field, the touchscreen is the biggest single difference between my T3i and the EOS M. The icons used on the screen are the same icons, and the controls are presented nearly identically — so getting used to the idea you can touch things to manipulate them, rather than use physical buttons, actually takes a moment. You can use the touchscreen to move quickly move the focus point, and there is even a “touch shutter” mode that takes a photo as you touch the screen — just like a smartphone. Not everything on the touch screen can be touched: You will sometimes see icons which are not buttons. The buttons are denoted by a rounded frame, while icons are left bare. 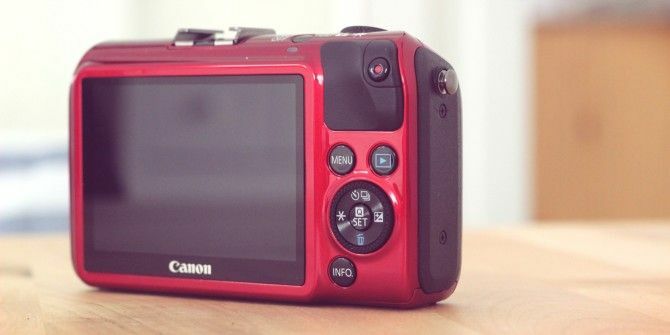 You will need to use the touchscreen to switch between manual mode, Program AE, shutter priority, aperture priority, and the various creative modes. That’s one operation that is notably slower on a touchscreen as opposed to a physical mode dial: With a dial, it’s a quick rotation to the right position. With a touchscreen, you need at least three taps. The same goes for exposure compensation: You can touch the familiar exposure compensation bar at the bottom of the screen, and then tap the screen to set the desired level. But it’s a multi-step operation, and it often feels cumbersome. Dangling from an R-Strap, the EOS M was barely noticeable in the field. It’s just so much lighter and less bulky than a full-size dSLR (or even a smaller dSLR such as the T3i). I could easily carry it slung over my shoulder for a full day and feel no strain at all. I took the EOS M outside on a hot, sunny day, and the bright screen did not disappoint me — as long as I was looking straight at it. Viewed head on (the way most photos are taken), the screen remains clearly visible, and the icons are crisp. It is when trying to get creative that the fixed screen’s limitations become apparent. Put it far over your head or close to the floor and peer at it from an angle, and using it becomes much more difficult. It’s not so much a panel issue: The viewing angle is quite good. It’s the fact that the screen is flush with the camera’s body. This part of the review is simple to write: The EOS M works, and it works well. It was able to quickly focus on my subjects, and I could get the shots I wanted. Fiddling around with the touchscreen was annoying at times, but for the most part, Program AE mode worked as reliably as I’ve come to expect from Canon’s dSLRs. In this section, I’ll let the camera speak for itself. Here’s a gallery of full-size images taken with the EOS M, unaltered and unedited in any way. To me, the EOS M offers a satisfying balance of price, performance, and form factor. If you’re in the market for a mirrorless camera and don’t mind the lack of an EVF or built-in flash, the EOS M should be near the top of your wishlist. Congratulations, Cheryl Torrey! You would have received an email from jackson@makeuseof.com. Please respond before August 8 to claim your prize. Enquires beyond this date will not be entertained. This giveaway begins now and ends Friday, July 4. The winner will be selected at random and informed via email. View the list of winners here. Explore more about: Digital Camera, MakeUseOf Giveaway. I'm a Panasonic user, I love Panasonic cameras. Believe it or not the Canon EOS is the first I am aware of, so have to pick it. I would have to go with the Sony Alpha NEX-7. I've been rocking my 350D for 9 years now... might be time to upgrade and downsize! I've never had a camera with changeable lenses so I don't have a favourite. But I really want one, and this canon could be my favourite! I did not have a camera like this, I can not have an opinion. I really like this cam! I want so long. Tamron is probably the best for me. I'm partial to Canon since I already own a Canon DSLR. I'm partial to m43 cameras and use an Olympus PEN often, but I've never used this Canon EOS M. I like the images I've seen from it. Favourite Interchangeable camera would be an Olympus EM-1 ! I'm still using an EM-5 though. Currently loving my Cannon EOS 600D - but looking for something smaller. um...the one I win here? I don't have a favourite yet but would like to try it out! I Do not have a favorite interchangeable lens, because I don't pay attention lens that much. I would love to win this Canon EOS camera with interchangable lenses. I had a 35 mm. Minolta camera a while ago I loved it, but it was broken. I have never owned a interchangeable lens camera, but I would love to own one. This Canon EOS M looks like a great camera to start with!! To be honest, I never owned one. To be honest, I don't have one ???? I have never owned a interchangeable lens camera, but I would love to own one and I think this Canon EOS M would be a great camera to start with! I've only owned Canon cameras growing up, and when the I switched to digital the lens was always an built-in automatic one, so I really don't have a favorite. Really want to get back into photography so I'll be testing out some cameras over the next few months to see what I like best. Wouldn't mind winning a camera though. Thanks for the giveaway. I dont have one with interchangeable lenses and I dont have a favorite because I havent looked for one like that because I would be able to afford it. My favorite interchangeable lens camera would likely be the Canon 5D Mark III if I could afford it, but of those that I own, it would be the Canon 6D. I have not had any experience with these devices yet, but I'm sold on this model -- EOS M.
I'm a big Canon fan, so I have to go with that one being my favorite. Thanks for a great giveaway! I have not used a replaceable lens camera before. The Canon EOS would be my first. I haven t any camera but the 5MP Panasonic Luminix is a camera with high performance and technology. I really like the SONY NEX-5N COMPACT INTERCHANGEABLE LENS CAMERA, but I am starting to like Canon EOS M better because of it's features and appearance. I haven't used a canon before but I've been wanting to, would love to win! According to this review, the Canon EOS M! I haven't used any interchangeable lens cameras yet. No doubt, this one will definitely be my favorite if I win it. My favorite interchangeable lens camera is the Sony NEX-5T. My fav is EOS Rebel T3i. I have never had a camera with different lenses, lol. I own a easyshare but would love to own a real camera! The Canon EOS is my first choice because it is very easy to operate. Performance and design is uncomparable and the price is well worth it. My favorite ILC camera is the Nikon 5300. My camera is my favorite eos 500d. i love Canon, it is because they have a good services that helps you in many ways. My favorite interchangable lens camra has to be the Nicon 300 dslr. I've never had one. I think this will be my favorite. I'd say a Canon 6D! But thats just too bulky and way too overpriced. I'd prefer a more compact and carry-able one! Canon EOS Rebel T3i is my favorite. I don't own one, but had a chance to use one for a day and loved the results. I don't use one, but my husband likes Canons. I never had an interchangeable lens camera yet. If I get this one, then it would be my fave. I never had a camera with interchangable lens. I don't have a favorite interchangable lens camera, although Canon is definitely my favorite brand. For now, the Sony NEX-C3 that I have. Canon EOS is my favorite. I've never had one. This looks like a good starting place though! i have an old 35mm non digital camera. i love the way the pictures turn out even when i take Night pictures, But i would love to upgrade. I have no idea. I never had a camera with interchangable lense . I don't have an interchangable len camera but my friend has a Sony Alpha NEX-5R. Thank you. I have a Panasonic Lumix DMC-G3 at the moment, but have loved using a friend's interchangable lens camera recently! I don't have a favorite but I've been using Canon products for years. My very first 35mm was a Canon A1. My favourite is from Canon. I don't have a camera that has a detachable lens. I have wanted to learn how to use a professional camera. My point and shoot is a Cannon. But i dont have any camera!!! I've never had an interchangeable lens camera but like the Canon brand. I have always been a Canon fan! I don't know, I've never owned a camera that has a detachable lens. I don't have a proper camera. I don't own a camera and my stupid phone camera doesn't work. Aughhh! Would be a blessing to have, so I could take pics of my grandkids!! I have never owned a camera. I love Canon EOS, I own a old EOS 350 DSLR, and I love it..
Appears to be a really 'inexpensive' way for me to upgrade my old EOS Rebel DSLR and STILL continue to use all my Canon lenses via the EOS M lens adapter! Plus, I pick up a few more 'pixels' in the process!!! Mine would be Nikon D7000! Don't really know much about cameras except that I LOVE Nikon! it woud be nice to winn somethig in life. and i think that this woud be a perfect start to win something! Always Canon. I've never had an interchangeable one, but I'd love to! My favorite mirrorless camera would have to be the Canon EOS M Mirrorless camera. I've always been a big fan of Canon. Beside's the old Polaroid Instamatic camera, a Canon AE1 Program was my first "real" camera. I never had one, and this Canon EOS M looks awsome. Currently my best interchangeable lens camera is the Nikon D7000. I have 3 of them since I have an underwater housing for that model and don't want to upgrade to the newer version yet. Great focussing abilities and low light performance. I've never really used one... but I'd like to. I have read your comparison above, I have done my research on both camera between Canon EOS M and sony Nex 5R, I found out that, the Sony Nex 5R has a 99 focus points (based on snapsort.com comparison), but here you put 25 focus point (correct me if Im wrong).. So I am kinda confused actually which is right. I might be wrong on the research I made, would you mind clearing this out? I used to have Nikon D90 DSLR camera but I sold it, now I am more interested to moving on to the mirrorless compact size cameras, because it is easier for me to travel around with, instead of having a heavy and bulky size camera stuffed in my travelling bag. I haven't been able to my hands on any of the mirror less camera yet (due to financial issue) , but I have done some research on what cameras that suits my interest the most. As to answer the question which mirroless interchangeable lens camera that I like..
Alright, I apologize if I have spelling error / grammar mistake. English is not my primary language. I'm a photographer, it was my job and it will always be my passion. But last summer, my son's father took my Nikon D7000, pawned it, and then told me over and over that he'd get it back and he never did. Gone forever--both the camera and the man. I've always been a Nikon girl,--the D7000 with a 55-300mm lens on it was my favorite--but the D7000 wasn't the first one I'd had and lost. My next camera, should I ever be able to afford another, will be a Canon. Hopefully I'll have better luck with it. I have never owned a camera with interchangeable lens's. Have no history with interchangeable lens cameras, but would love to get some and I think this Canon would be a great place to start. I've been an EOS girl for years. My current 350D is in need of a serious upgrade and this would be amazing. No more blurry school awards ceremonies, sports days or any number of events I seem to be snapping every week. My favourite would be the Canon 600d that I used for a school project, it was quite nice though a little bit big. My only interchangeable lens camera experience is the my Canon 5D mark III. I find the whole camera itself very bulky. I took it on a travel holiday to Fiji and USA and it just became too heavy to carry and lug around the trip. I left it in the hotel most days. I don't have any experience with interchangeable lens cameras, so I don't have a favorite. I would definitely like to try them out, though. This one and the Nex 7's. I think this wonderful piece of kit , would make an ideal travel camera, without attracting too much attention etc.. The Sony Alpha series interchangeable lens cameras have a high MP with a small body. For me it would be Fujifilm X-E2. Canon EF OR EF-S are my lenses of choice. I usually stick with Cannon. Don’t own one, but I’d love one. My Canon 200MM lens thanks so much for offering a great camera in your contest! I've been pushing my poor little Pentax Q for good results (and he's been quite reliable), but it's time to try the Canon EOS M! Don't own one, but I'd love one. I like the sony alpha series of interchangable lens cameras. I have never used an interchangeable lens camera. I don't own a touchscreen, so hope to win. at first, photographing is not something i really think of it. after sometime travelling with friends, it's good to have one. Canon might be the first that i wish to own it!!! I am an interchangeable lens virgin. Never used one.....yet! But I do love my Canon cameras. I really don't have one. Thanks for giveaway! I do not have one, but I have always wanted one. My favorite interchangeable lens camera would be my Canon XTI, this is an older camera but still works fine. ?Would really love to win this newer model camera, mine is to heavy for me to carry because I have MS and arthritis. I have Sony Nex-5 and am lovin' it. The EOS M just might be my favorite. It looks pretty cool. My Nikon D80. I know its old but its been reliable. The Canon EOS M might be if I win it. I like the Sony mirrorless line. Have to win one to be able to make comparisons. I've never had a high quality camera, so I don't have a favorite, but I would love to win this and learn to be a good photographer. I've been trying to find a simple-to-use camera which takes good quality shots for years. Tried Sony Cybershot - it had a fault from the beginning which was not fixed satisfactorily - then got a Panasonic Lumix, which developed a hazy spot on one part of the film. Have been recommended the Canon, so the EOS-M sounds like it could be the one! I haven't really played with many. I owned the D3100 years ago and really liked it. No favorite here, I don't own one. Which is why I want to win this one. Don't even have a smartphone as a substitude. I don't have a favorite at this time. It use to be my Canon, but that was before the day of digital many many years ago. My first is only D3100 Nikon and i am still using it. I would love to try Canon brand would be amazing to have a try and experience it. Im using a Canon T3i, i'm really happy with it. The Sony NEX series is awesome! At the moment, my favorite is my Canon EOS 5D Mk II, which is really great, but I still can think of a few improvements ! I like the Sony, however after this review the EOS-M sound pretty nice too! I don’t own an interchangeable lens digital camera. That is why I’m entering the contest. I only have a point & shoot camera, a Kodak Easy Share, but it has so many limitations. I used to have a Minolta SLR and I really miss the lenses and filters it had. My most satisfying experience with an interchangeable lens camera is with the DSLR. The EOS sounds a lot cheaper with similar features though. I'm rockin' a Canon T3i that I am very happy with. Olympus OM-D E-M1 or the Canon D70 We've been buying Canon's for years.. I like the Canon EOS M. I am glad to know Canon has a mirrorless camera. i have a Nikon with interchangable lens but would love a Canon! i have an old canon xti. I haven't really had an interchangeable lens camera sense my Canon AE-1. I'm wishing to start with a new one. This Canon EOS M is my favorite interchangeable lens camera because it's compact, mirrorless, and affordable!! It's got all or at least most of the features of a DSLR in one little camera! I would love to have the Canon EOS M. I have never owned one but this sounds really good! Canon 5D Mark III, hands down. I've never owned an interchangeable lens camera. Would this be a good starter? I have many interchangeable lens film cameras. I don't think the transition will be difficult. This would be my first interchangeable lens digital camera. I look forward to using it. I don't own an interchangeable lens digital camera. That is why I'm entering the contest. Canon 400D or 1100D - though with weakening hands, those are now far too heavy for me to handle. I never had one so I can't say yet. This would be my first interchangeable lens camera if I win. The Canon EOS M might be my favourite. Cannon Rebel T2i as it is the only one I have used. Samsung makes a great camera. The nx platform will hopefully catch on. Don't have a cam.. .. let me try this one! The Canon EOS M is my favourite. Typically Ive been a Nikon user and have two cameras that I use with lenses I have. But I have always wanted to try a Canon. So if I win I will get my chance, if not I will continue using my Nikons because they are great. I don't have a camera with interchangeable lenses yet. I am not sure because I have not tried one myself, but I think the idea is a good one. I like the Canon Rebel T3. I love my Canon T3i. I got it as a graduation gift, and it's been an absolutely fantastic camera for the price! My favorite is still my 40 year old Mamiya-Sekor 1000DTL 35mm. Had a Rebel X1S for years, and It's served me well. I'll never had one interchangeable camera, this one migt be my first if i'm lucky enough to win. good old friend, the 20IS is getting old and need to be retired. Not everything works as before. I don't have a favorite. No DSLR. The one I win for free! Say the Canon EOS M...please pick me! Canon, would be my pick, even if I didn't win !!! My Nikon D40 has served me well for nearly a decade, but I've used Canon in the past and have been pleased with the performance. The last interchangeable lens camera I had was a 20 year old second hand Nikon. My husband has a Rebel, bu I never get to use it. Not a clue, dude. Not a clue. I don't ave one yet...this one if I win. I don't have any experience with them yet, but so far I'm sold on this EOS M. I love Canon products, always have, especially their cameras. Canon EOS M will be if I win. Rebel XTi did the things for me, but I would rather go with D90. Cheers! I don't own one but if I win Canon EOS M maybe the one. I'm a Canon girl and so far ever since it got released and i got it my Canon 400D has been a dream to use. Yes i should probably upgrade and I will soon but at the moment it is working like a clock and the images are simply amazing. I was not familiar with them until now. I would like o try the Canon EOS M.
My favorite interchangeable lens camera is the Sony Alpha NEX-6, but this one is pretty neat and if i get the chance i'll try it out! Thanks Makeuseof! I'm thinking, my best experience has been with Nikon, so I think their cameras are the best. I've never owned one and am looking forward to trying one out! I'd go with the Sony Alpha ILCE-7R. Full Frame in a nice and compact body with the right price tag. Canon cameras are the best! IMHO. Nikon are my favorite ! My handsome experience and i like to Nikon D90 best. My Canon that I've had for over 20 years. I had a Canon A-1, AE-1, F-1...liked the F-1 best. Rebel 450D has always been my close friend. Thanks for the giveaway. I think the Fujifilm X-M1 would be a nice choice. I don't have an interchangeable lens camera and I'm not familiar enough with them to have an opinion. At first look I think thi is simple camera. Now I want it more!!!! Don't have one. But Canon 5D mark III will be good. Could never buy one, because they are expensive!!!! I have an old Nikon. I have a Sony A700. Could never buy one, because they are expensive!!! I've been using a Canon 20D for a number of years and have been become comfortable with it. In some respects it is my favorite as I use it the most. On the other hand, you just can't beat a Hasselblad. Yeah, the 500 series has been around for quit a number of years, but it is still one of the best cameras available. Lastly, when I need really big negatives to produce really big prints (say 5'x 8') I drag out the Calumet 4"x 5" monorail view camera with an incredibly crisp Schneider 75mm f/5.6 Super Angulon lens. Each one is a favorite for a specific purpose. My old Minolta SLR, and my old sony DSLR that uses its lenses. I know almost nothing about cameras and their lenses. Won't have an interchangeable lens camera until I win this one. Then it will certainly be my favorite. Sony Nex, but I'm a Canon fan! I have never owned one, so I don't really know, but I'd sure like to try one!! Thanks GT Omega Racing and CazuaLLUK for the Great giveaway! I like it, I need it, hope I win!? As I have never owned a DSLR camera I have no idea what would be the best interchangeable lens. I would like a telephoto one as I like to take a lot of nature shots with my simple point and shoot camera but a telephoto lens would help me get some good pictures of birds and animals in the woods. Olympus EPL 3, Small enough to carry around. I have never owned a camera that had interchangeable lenses. I would love to have this camera as have been looking for a new Camera. I have used as a test for the Nikon 1 S1 and would say that's not the best one for mirrorless which you also explained here. I have never had a camera that you can change the lens on. The 5DM4 is a great lens, which I would love to have. I nearly bought one a while back. Nice little camera. Enjoyed the rundown. Thanks. Canon 6D, though I would love to get a 5DM4 when they come out with it in a few years! Currently, I don't have one. I laying on to my phone. I hope I could win this one. Thank you.. I'm like some of the others...I've never really had a good camera so no favorite. Don't have one yet, this is all new to me. I haven't had a chance to try many, but this one looks pretty good! This one sounds great. I haven't tried any yet though. I don't have one. This is new to me. I have a Canon EOS 60D. Can I use those lenses? Probably my old OM1. Superb photos. I've tried the Panasonic G5, Nikon J1, and Sony NEX5. I'd love the chance to compare the Canon M.
I love the Sony NEX series which will apparently be marketed as just Sony a system cameras from now on. I own a Sony NEX-3N and love it! I haven't had the opportunity to use an interchangable lens camera. This would be a huge step up from my PowerShot. I owned a Minolta 244D that was old school film camera. I have a 'super-zoom' camera, so have yet to move up to an interchangeable lens camera, of which Canon's have an excellent reputation. I've never owned an interchangeable lens camera but I love Canon products. Seeing as I don't have an interchangeable-lens camera...and the ones in my phone and tablet are crappy (no LED flash and 3MP or less)...this has got to be my favorite. The iphone with a len camera kit? The Canon EOS M Mirrorless Camera since I have no knowledge of this area so I will assume the review is believable. I really love this particular Canon because I did try it and it is amazing. Never had one - they've always been too expensive for casual use. I hope to have a favourite one soon. My favourite interchangeable lens camera is still the Canon 5d MK II. Although there is better out there, it forever changed the way video and photography can be captured. I would have to say the Canon EOS M because I could use all my EF lenses with it!!! I'd love to win this!!! Only interchangeable lens cameras I've owned were Olympus SLRs. I don’t have a favorite because I’ve never owned one. I've only ever owned Canon SLRs and DSLRs, so I guess they are my favorite. I'm not really sure... I've never actually had one. Cannon SL1 is my favorite. I have had Canon cameras in the past. Always great quality, and therefore, my favorite! I don't have a favorite because I've never owned one. I had an older Pentax years ago that I used different lenses with but as yet I don't own a DSLR, but would love to! I need to think on this one... seems a great camera to replace my aging Olympus e-450. I've never had one :( not really a photographer to even need these kind of gears, but it would be nice if I have this one! I don't have one yet...this would be a very good start to be able to make comparisons! Not sur, I like the Canon Rebel, but been burned in the past by Canon, so not sure. I currently use a Canon 450D. I like Canon but I think currently my favourite one on my wishlist is the Fuji X-T1. Great image quality, great body, great lenses. Fuji are really doing a good job with the X-Series. Although I wish Lightroom's raw support was better for it. I like the Olympus or the Canon. I also like the Sony. I love the Samsung NX2000. We love our Canon Rebel! I currently have the Canon 70D and it is great. I still own my previous Canon 50D and a canon G15. dont have any yet. Pondering to get NX5 for quite sometime. Right now, I don't have a favorite...seems pricing has kept me on the sidelines. I love Canon products.I like the Canon Rebel alot. I currently have a Canon Digital Rebel XTi, which I love. If I win this, I'll be happy to buy the adapter so that I can use my existing lenses with this one. Wow, that's awesome! I like the Canon Rebel. Canon EOS M :D This one is really on my list of gadget that i really wanna have. Really like how compact it is.Can be easily carried and use around. I have always been a Canon fan. I think their images are the best. I like the Canon Rebel. I like the Olympus OM-D EM-1. My Canon 5DM3 has yet to let me down (other than struggling with the AF in some low-light settings). I'm all Canon already.. my XTi has been my sidekick for quite a few years. I'd be happy to have this camera Since I don't have one. I love my Pentax Q. Such an underrated camera. My personal camera is a Samsung NX2000. It´s a great camera! I have to admit that I really like the ones with a vintage style body. FujiFilm comes to mind. Conflicted on EVIL, Electronic Viewfinder Interchangeable Lens. dpreview.com gives handy side by side comparisons and wikipedia also helps to learn the family tree of model numbers, but the key factors for portable, big-sensor shooting come out in so many combinations by the various makers. Pocketable nikon 1" or sony 1" (rx100 gen 1, 2 or 3) are attractive, but for the added sensor size, perhaps sony nx-5 is the model to trial; although user menus seem less friendly that canon's organization of functions, I have read. I really like the Moto G for its pure Android! Sub-$400 Android phone of choice? OnePlus One. I think the question was wrongly posted. Cheap smart phone I would want is MotoX. Mirrorless dSLR I want is EOS. I'm using a Samsung Ace which is holding up well despite its age. The EOS looks quite toy like in any colour other than black.